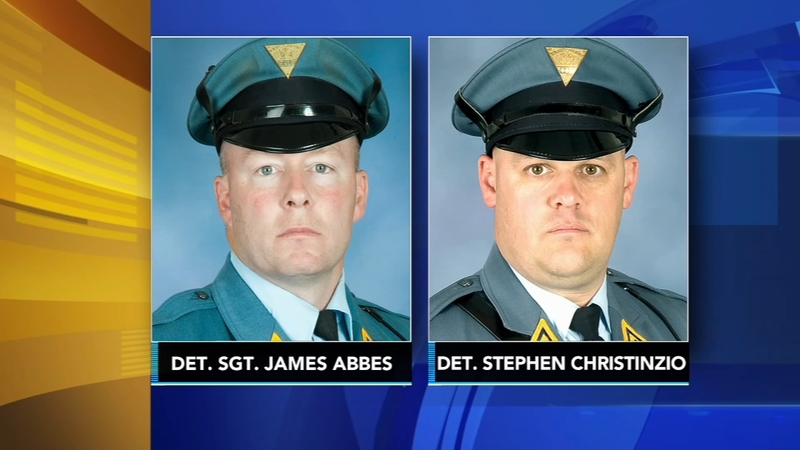 EWING, N.J. (WPVI) -- Two New Jersey state troopers who successfully deactivated two improvised explosive devices following a terrorist attack have received the 2017 Trooper of the Year awards. Detective Sgt. James Abbes and Detective Stephen Christinzio were honored Thursday for their actions after a pipe bomb exploded along a Marine Corps race in Seaside Park in September 2016. The devices were in the same trash can that exploded before the start of the race, which had been delayed. No one was injured. The awards were presented Thursday at State Police headquarters in Trenton. Upon their arrival at the race scene, Abbes and Christinzio donned protective gear and approached the explosives before setting up their equipment, including robots to deactivate the devices. "Detective Sergeant Abbes and Detective Christinzio performed with calm and focus while under extreme stress, ensuring the safety of others first before risking their own lives to execute their mission, without the luxury of knowing if there were more components of the attack yet to be acted," state police Superintendent Col. Patrick Callahan said. A federal judge this month sentenced Ahmad Rahimi to multiple life terms in prison. Prosecutors say Rahimi, a naturalized U.S. citizen born in Afghanistan, set a pressure cooker device that blasted shrapnel across a New York City block. The blast injured 30 people, hours after the explosion at the race.